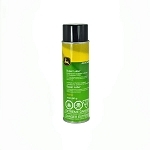 John Deere tire sealants are made of thousands of fibers and rubber particles in uniform suspension throughout a non-toxic, environmentally safe, fluid carrier. When a puncture occurs, the escaping air forces the carrier and fibers to the penetration point making a solid, permanent repair from the inside out. There is no chemical reaction. Rim and bead leaks and inner liner porosity problems with tubeless tires will also be sealed quickly and effectively. Our special chemical formulation will condition the inner liner to prevent dry rot and cracking which can lead to chronic slow air loss and premature tire failure. A simple, direct, cost-effective preventive maintenance program to save money, avoid downtime, and increase profits. Install the sealants in new equipment. 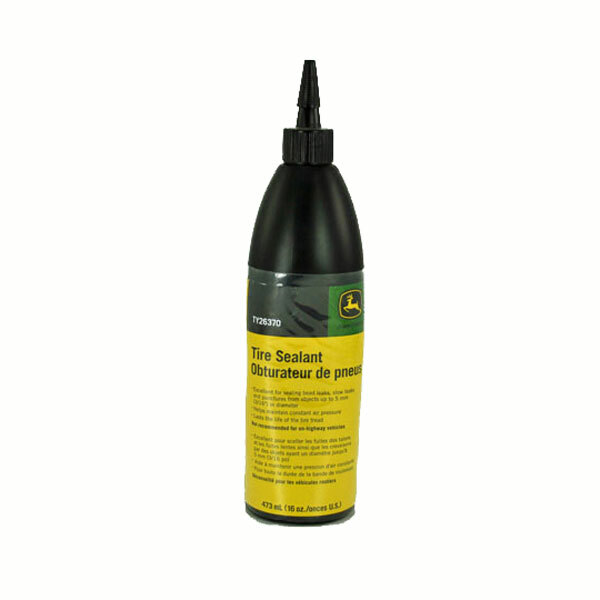 John Deere tire sealant has been manufactured specifically for tires with higher rpms, including over-the-road applications for vehicles over 18,000 pounds gross vehicle weight. 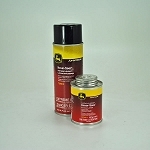 This formulation of tire sealant is also manufactured to perform well in small tires running at higher revolutions per minute (e.g., lawn maintenance equipment, ATVs, golf carts, bicycles, trailers, etc.). The sealants will seal hundreds of punctures up to 1/4-in. (6.4 mm) diameter as they occur, and work to maintain constant recommended air pressure for the life of the tire. Unlike most competitive products, John Deere tire sealants are safe, non-toxic, non-flammable, and environmentally safe. These products protect tires used in agricultural, construction, industrial, logging, mining, and lawn-maintenance operations.